More than 90% of the cells in the human body are microbes. Medical science now realizes that the microbes living in and on humans and other animals play major roles in disease and health. Ecologists now realize that to understand how climate change affects animal species, we have to understand how it affects the microbes that inhabit them. 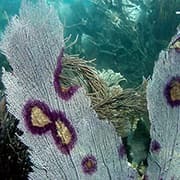 The Ellner lab, in collaboration with the Harvell lab and scientists at Mote Marine Lab, have developed models to understand how brief warming spells can cause the microbial community of corals to shift from mostly protective microbes that produce antibiotics, to mostly disease-causing microbes, and to remain disease-dominated long after warming spells have ended. Photo at left illustrates a Caribbean sea fan coral Gorgonia ventalina attacked by a recently emerged fungal disease. The prevalence of the disease became much lower following rapid evolution of disease resistance in the coral population. In the past decades, a suite of new epidemic diseases have emerged in both humans and in animals. The Dhondt lab has been studying how the bacterial pathogen Mycoplasma gallisepticum (related to the human tuberculosis bacterium) spreads, how it has successfully jumped from poultry, its original host, to house finches in nature. 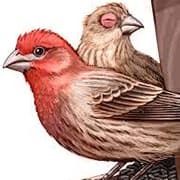 Dhondt's group is also investigating why the pathogen has reduced numbers by half of its primary host, the house finch from Eastern North America, while the pathogenic effects are relatively mild in house finches living in Western North America. By combining continent-wide studies made possible by the help of citizen scientists, with detailed local population studies, and experimental work, Dhondt and collaborators are constructing models that describe the spread of the pathogen and disease dynamics. Such mathematical models can then be used to predict the spread and host-pathogen dynamics of other emerging diseases. In the last 30 years, amphibians have declined substantially on a global scale and a number of species have become extinct. The causes of amphibian decline are varied, but one important factor is disease. Professor Kelly Zamudio's lab studies the amphibian-killing disease chytridiomycosis, an infectious disease that is caused by a fungus (Batrachochytrium dendrobatidis, or Bd for short) that is responsible for amphibian population declines and extinctions worldwide. They are interested in how the disease affects some species more than others, and how some populations within species will succumb to the disease while others survive. 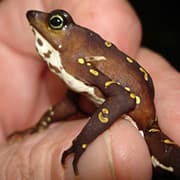 They are investigating whether differences among amphibian species in susceptibility are explained by genetic diversity of frogs (the hosts), or due to the genetic diversity of the fungus (the pathogen).